Today’s sporting vehicles offer specialized amenities and comfortable interiors that will elevate your expeditions. An epic overland journey could be accomplished with just a Land Rover equipped with sand mats and jerrycans, and a weekend of hunting might entail nothing more complicated than tossing a rifle on the rack in the cab of a pickup truck. But the latest sporting vehicles offer specialized features and amenities that bring the hunting experience into the luxury era. The latest generation of expedition and hunting transportation is as rugged as ever, but nowadays they are also likely to feature advanced options and high-end interiors reminiscent of luxury cars or yachts. Balancing form and function, 21st century adventure vehicles are more customizable than ever, capable of being updated to very specific outdoor pursuits and needs. 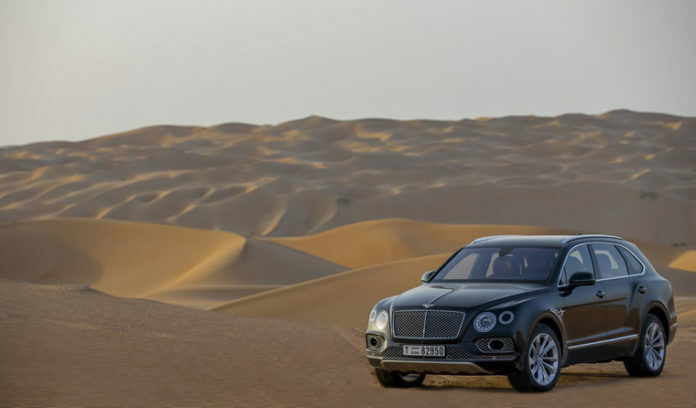 A sterling example is the Bentley Bentayga Falconry by Mulliner, a super-luxury SUV specifically outfitted for hunting with birds of prey. Launched in May 2017, the limited edition vehicle is handcrafted at the Bentley factory in Crewe, England, and equipped with just about everything needed for a successful falconry expedition. Pricing starts at $229,100. 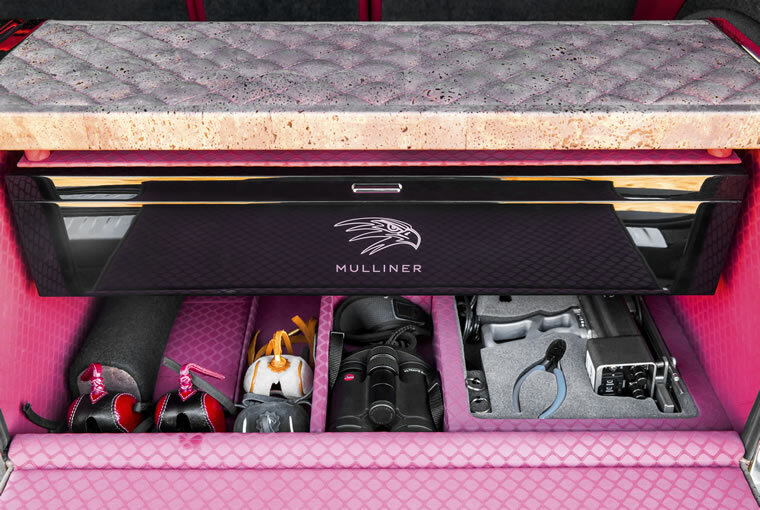 The tailgate of the Bentayga rises to reveal a master flight station with a “black piano” veneer compartment where all of the accoutrements of falconry—leather bird hoods and gauntlets, binoculars and GPS tracking units—are stored. Next to this is a special pocket that carries two individual perches that are inserted into the horizontal outer edge of the trunk floor during practice or active hunting. Rounding out the rear of the vehicle is a refreshment case with three metal flasks and cups, face cloths and a blanket. Both the flight station and refreshment case are trimmed in natural cork fabric and set in movable trays that make them easier to access. During the drive to the hunting ground, falcons rest on special transportation perches tethered to the central armrest in the backseat. This strategic position also allows the falconer to prepare his birds in air-conditioned comfort. The falconry amenities are complemented by all of the handcrafted luxury and sophisticated electronics that go into every Bentayga. Among its many features are eight different driving modes (including a rugged off-road setting), multimode air-suspension, antiroll control system, and a twin-turbocharged 6-liter, 12-cylinder, 600-horsepower engine that hits a top speed of 187 miles per hour. At the opposite end of the adventure spectrum are customized expedition vehicles like the wide range of off-roaders created by Unicat in Germany. The company morphs ordinary, factory-built trucks and vans—from the likes of Mercedes-Benz, MAN and Iveco—into extraordinarily rugged, long-distance machines. Unicat produces three distinct lines with vehicles ranging from about $500,000 to more than $3 million. TerraCross includes modified entry-level adventure vehicles like the Mercedes-Benz Unimog or MAN TGM. The Individual line offers fully customized vehicles and runs a broad gamut from Iveco vans to hulking MAN TGS trucks. The Professional line, meanwhile, includes specialized trucks ready-made for the Dakar Rally. The TerraCross or Individual lines are best for a weekend of off-roading in the United States rather than a six-month journey across the Sahara or Arctic, says Unicat Americas CEO Avi Meyers. “But all Unicats are designed, engineered and built to tackle extreme conditions and terrain,” he notes. Unicats can be customized for any personalized activity or hobby—hunting, fishing, diving, surfing, kayaking, skiing, cycling, motorcycling and photography, just to name a few. The sky’s the limit when it comes to decking them out. “Unicats can be outfitted to extraordinary standards of high-tech, performance, range, security, comfort and luxury,” Meyers says. The menu of Unicat amenities includes a queen-size bed in a master bedroom warmed by radiant heat; a full-size kitchen with handmade “no shake” drawers; teak flooring and Alcantara microfiber upholstery; a “no shake” television cabinet with a 32-inch screen; satellite reception and Bose surround-sound speakers; as many as six air conditioners; and 600-liter (158-gallon) freeze-proof drinking water tanks. At Broadfield, specially modified pickups are used for hunting quail, pheasant, wild turkey and more. 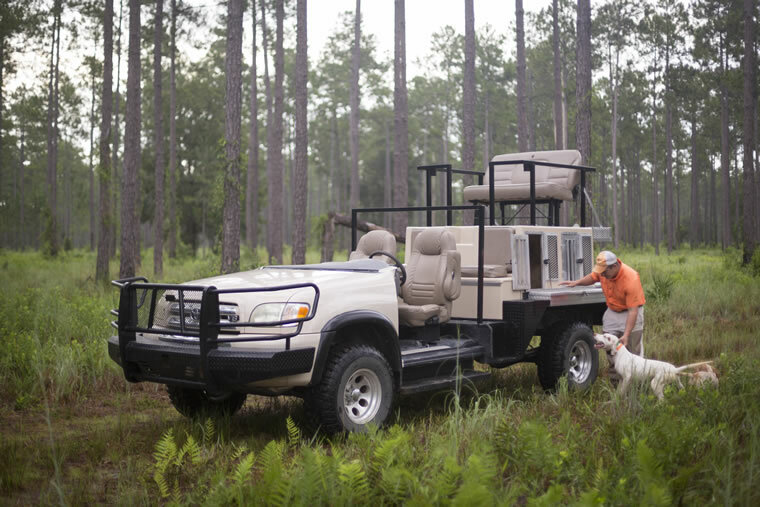 Vehicle customization is also important to the pros at Broadfield, A Sea Island Sporting Club and Lodge, where a specially outfitted pickup truck is the off-road transport of choice for hunting and fishing forays around the 5,800-acre sporting club. “Most any make of vehicle—full-size truck or Jeep—can be customized,” says Broadfield manager Lee Barber. Broadfield’s pickups are primarily used for hunting quail, dove, pheasant and wild turkey, but can also be used for transiting to other sporting pursuits including clay shooting, shooting rifles and pistols, fishing and deer hunting on a spread that was once part of one of the oldest hunting clubs in the Southern United States. Another outfit that tailors American pickup trucks for high-end hunting, camping and other outdoor pursuits is EarthRoamer. 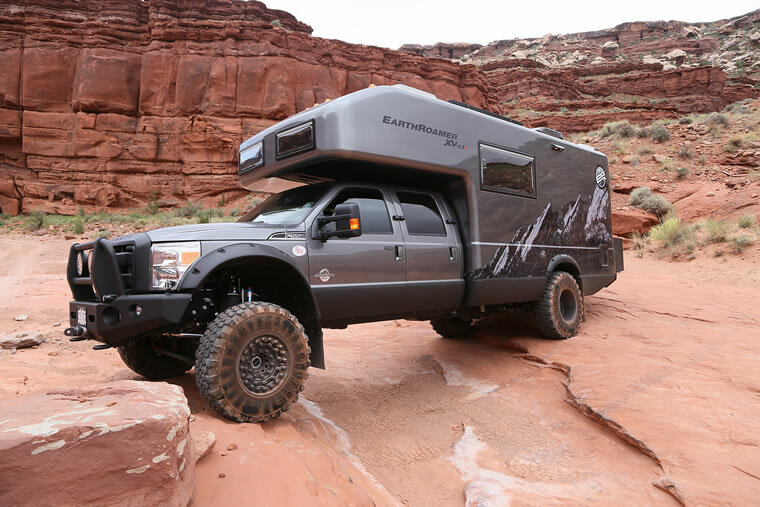 The Colorado-based company starts with a four-wheel drive, turbo diesel, Ford F-550 and builds out from there to create a highly customized end product dubbed the XV-LTS. Powered by a combination of solar, battery and diesel, the eco-friendly vehicles are personalized for each owner with a blend of comfort, craftsmanship, convenience and rugged capability that allows it to operate in any and all seasons. So, what do you get for the $438,000 price tag? Start with a 900-mile range, capacity to hold 90 gallons of diesel as well as 90 gallons of water for drinking, showers and cleaning. Add 1,200 watts of solar power from roof panels that feeds into a 12,000-watt-hour battery bank that allows you to keep the fridge cold, the air conditioning or heating running, and outside vehicle lights on even during cloudy days. The one-piece molded composite camper body on the XV-LTS can sleep up to four in incredible on-the-go comfort and sit up to six for meals, movies, Monopoly and whatever else you desire. Speaking of entertainment, the cabin’s standard 32-inch screen is linked to HD satellite TV and Bose 5.1 surround sound speakers. The kitchen dining area is equipped with a compressor fridge/freezer, microwave and stove top, and an optional wine rack and Keurig coffeemaker. His first vehicle was a customized Dodge Ram pickup outfitted for extended trips into the wilderness. By 2003, Swails had started the company and created the XV-LT—an all-weather, all-season, all-terrain, self-sufficient vehicle capable of providing a plush camping experience without the need for power, water or septic hookups. A second generation EarthRoamer is currently in the works. The soon-to-be-launched XV-HD ups the ante to 115 gallons of diesel, 250 gallons of freshwater and a 20,000-watt-hour battery bank for those who want to get even farther off the beaten track and stay there longer. Long before any of these other companies were customizing adventure vehicles, Sportsmobile, founded in El Paso, Texas, in 1961, was bespoking Ford and Volkswagen vans. In recent years, Sportsmobile has moved from Chevy vans and Ford Transits to Mercedes-Benz Sprinters, luxury conversions that cost up to $95,000 including the cost of the original vehicle. The Penthouse version is the most expensive—outfitted with a pop-up ceiling area with five large screened windows that provides a more spacious dining and living area in addition to sleeping two. Among the entertainment options available on all of the Sportsmobile Sprinters are widescreen TVs and satellite TV dishes or roof receivers. There are also a wide variety of bed options, from single bunks to queens. Interested buyers can also include ParkSense parking assist sensors (front and rear), high-intensity discharge headlights and four-wheel drive. 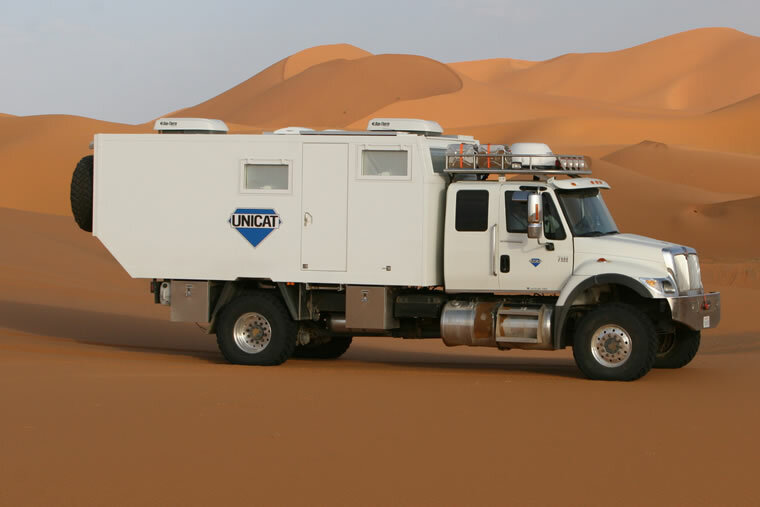 Sportsmobile also produces the Ultimate Adventure Vehicle with four-wheel drive and big wheels based on a Ford E350 1-ton cargo van. Whether you are looking for luxurious accommodations for lengthy excursions or specific features for a particular outdoor pursuit—or a combination of both—the wide range of modern vehicles available today will ensure that you are well-equipped for your next hunting trip.